Of course, we can’t offer you the high-class experience you desire and deserve without having staff armed with the knowledge, skills and personality to do so. If you’ve been keeping an eye out on our blogs recently you may have noticed we’ve been focusing on some of our staff so you can find out more about them – if not you can take a look back through our archives to browse any of the ones we’ve already published. Today our staff member in the spotlight is valeter Phil Jones, who joined the team in May 2016 – so celebrates his one-year anniversary with us this month – and has been described as ‘the most cheerful man on site’. 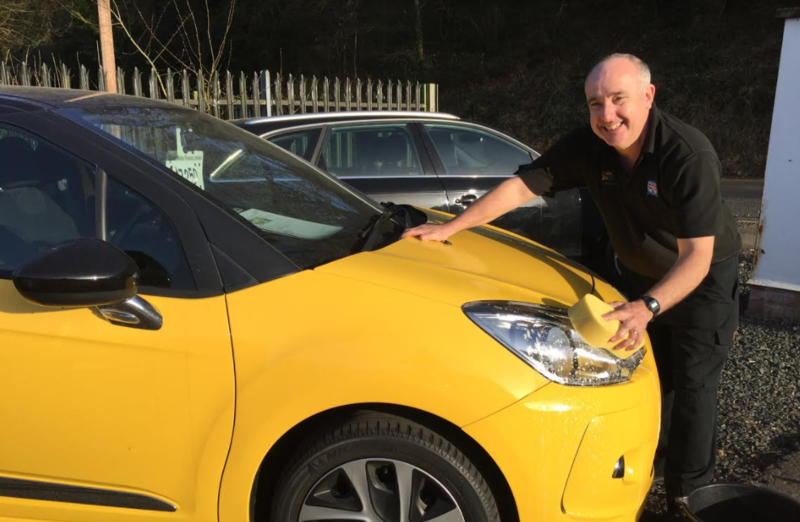 The Bridgnorth father of two’s daily tasks include valeting, collecting and dropping off customers and test driving cars to ensure they are in full working order before the keys are handed back over. He says: “I am Mr Plasticine man – I am stretched from pillar to post and will help out with everything, I absolutely love it. “My day starts before I leave home with the anticipation of something new. You never know what will be put in front of you. “It is great to be part of a team that is so dedicated to providing people with what they would want to have themselves. It is a very high standard. Phil added despite being the ‘old man’ of the team he gave the other staff a run for their money and hoped his enthusiasm rubbed off on everyone. “David Dexters is well known and respected in Bridgnorth and I am really proud to work here.